Takeda's Dr. Noga and Dr. Palumbo discuss the role of combination therapy in the changing treatment landscape and provide an overview of NINLARO for the long-term* treatment of multiple myeloma in patients who have received at least 1 prior therapy. The views and opinions expressed in this video are those of the presenters and Takeda Oncology. Dr. Robert Vescio of Cedars-Sinai Medical Center discusses his views on PIs being the standard of care in multiple myeloma treatment and why PIs, such as NINLARO, should be used long-term. 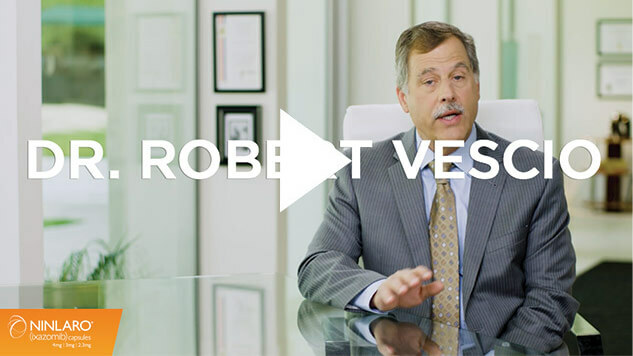 The views and opinions expressed in this video are those of Dr. Vescio and Takeda Oncology and do not necessarily reflect the opinions of Cedars-Sinai Medical Center or the Samuel Oschin Comprehensive Cancer Institute. 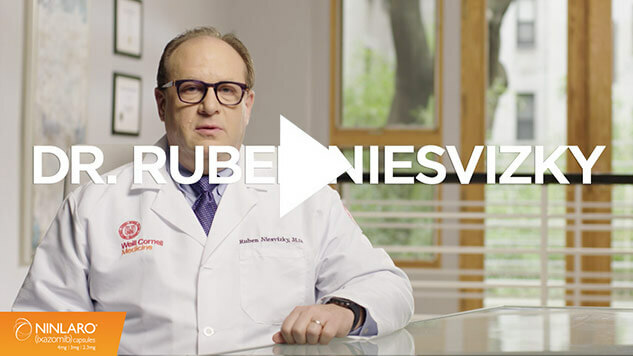 Dr. Ruben Niesvizky of NewYork-Presbyterian Hospital discusses how NINLARO was studied in a broad range of patients reflective of his patients in real-world practice who may benefit from oral proteasome inhibition. The views and opinions expressed in this video are those of Dr. Niesvizky and Takeda Oncology and do not necessarily reflect the opinions of NewYork-Presbyterian Hospital, Weill Cornell Medicine, or Cornell University. Dr. Vescio is a paid consultant of Millennium Pharmaceuticals, Inc., a wholly owned subsidiary of Takeda Pharmaceutical Company Limited. Dr. Niesvizky is a paid consultant of Millennium Pharmaceuticals, Inc., a wholly owned subsidiary of Takeda Pharmaceutical Company Limited. This content is intended for informational purposes only and is not a substitute for your clinical knowledge or professional judgment.